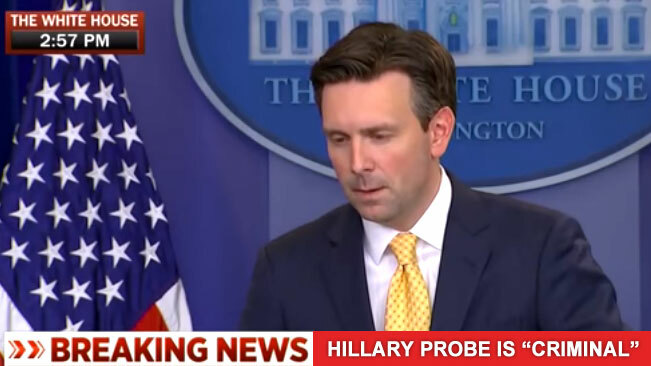 White House Press Secretary Josh Earnest had a slip of the tongue yesterday at a press conference when he referred to the FBI’s Hillary Clinton email probe as a “criminal investigation”. This gaffe, which directly conflicts with the Hillary campaign’s insistence that this investigation is administrative and not criminal, is likely to be met with criticism as mainstream media’s bias towards the former Secretary of State is extremely high lately. If you can remember back a year ago, the Hillary camp even pressured the New York Times to retract a statement referring to the investigation as “criminal”, a move that has haunted her ever since. The question remains what Hillary’s campaign, along with her supporters, are going to say when they see video evidence that the White House views the investigation as criminal, which means, at the very least, that a *possible* criminal is running for president, though most of her opponents would not use that terminology.